Aesthetics: This case is certainly sleek and attractive with its metallic finish polycarbonate bumper and TPU mesh backing, which explains why it is one of the most popular cases on the market. Rating: 4 out of 5 in aesthetics. Ergonomics: The Neo Hybrid doesn’t veer too far from the feel of your iPhone 6 or iPhone 6s. In fact, with its slim design and metallic finish, the Neo Hybrid is about the closest you can get to the original feel of your iPhone. Its TPU mesh backing also makes it easier to grip. However, the polycarbonate bumper is rather slippery, making it easy for consumers to drop, and sometimes can make it a little tricky to easily access the side buttons and ports. Rating: 3 out of 5 in ergonomics. Protection: Spigen claims that the case is certified military grade drop tested, which certainly gives consumers a sense of security when purchasing this item. However, many customers have complained that the case has a tendency to break over time along the outer rim. Also, the case provides little protection to the phones display. Rating: 3 out of 5 in protection. Price: The Neo Hybrid is priced at $34.99 retail on Spigen’s website, which is a bit expensive for what is included inside the packaging. Rating: 3 out of 5 in pricing. 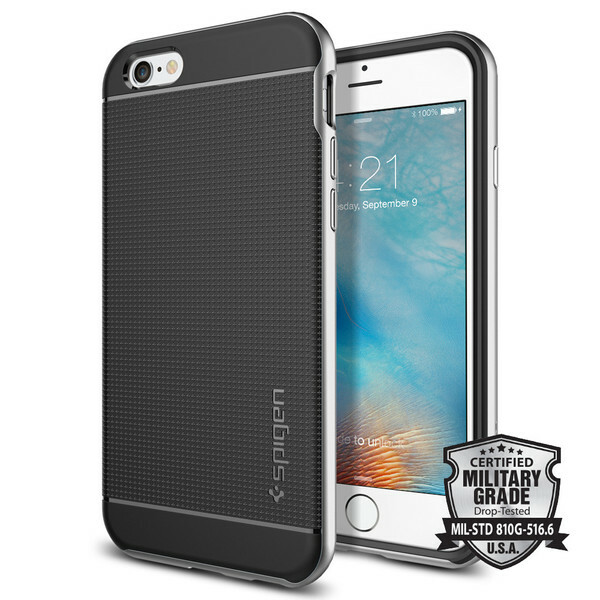 Customer Reviews: Based on thousands of consumers reviews, the Spigen Neo Hybrid has upset many customers due to some apparent design flaws. However, 68% of the consumers give it an A grade. Overall, it’s a good case for those that want a slim case with less-than-average protection. Rating: 3 out of 5 in reviews.